A Group Rate on 5 big cabins or more. AAA approved Christian resort with group lodging accommodations and services. 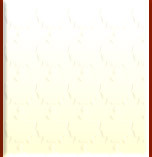 AAA approved Christian resort with group lodging accommodations, amenities and services. 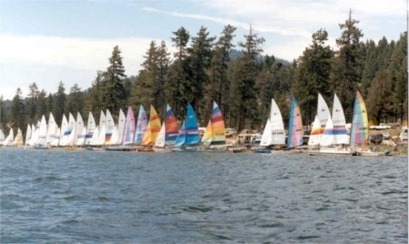 Big Bear Lake is Southern California's premier four-season vacation destination... 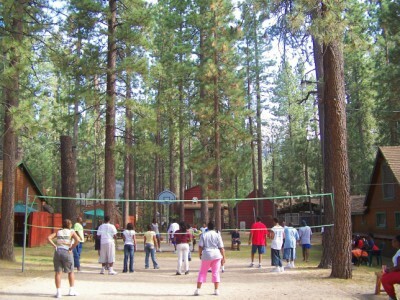 The best Big Bear Vacation Planner · Group Deals, Specials and Discounts for schools, teams and churches. 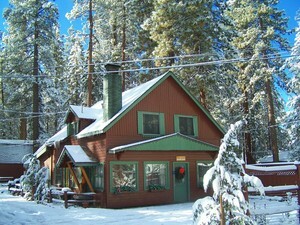 Every size Big Bear Cabins For Rent. Cottage rentals for any size family reunion or group retreat. Big Bear resort cabins at Golden Bear Cottages Resort resemble story-book cottages that are perfect for couples, small, medium and large size families. 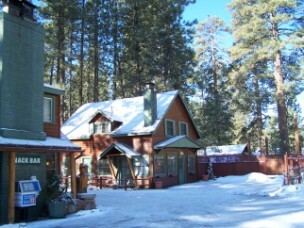 These historic resort cabins at our AAA approved lodging property are easily identifiable as a group of free-standing rental cabins at 39367 Big Bear Blvd. in Big Bear Lake. Golden Bear Cottages can easily be recognized as its own quaint village. Come, bring your family or group and enjoy our outdoor spa, heated pool and recreation areas. SO CAL SCOUT LEADER RETREATS. The Big Bear Lake Visitor's Information Center at Golden Bear Cottages is open Sunday through Thursday from 9 a.m. to 5 p.m., Fridays from 9 -a.m. to 9 p.m. and Saturdays from 9 a.m. to 6 p.m. Come in and see what we can do to help you with your stay in Big Bear Lake. Ask for free maps, weekly newspapers, and Big Bear Lake area information pamphlets. 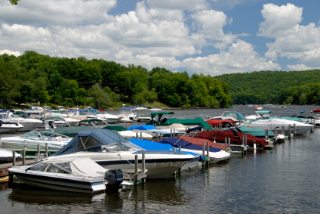 Ask about up to 50% savings with the Golden Bear Cottages Vacation Club and 20% marina discounts next to us in Big Bear Lake. A Group Rate on: 5 big cabins or more. 4x4, bike, quad or SxS. The maps are available FREE at our office in Big Bear Lake. Then , for you snow enthusiasts we are right in the middle of Southern California's most popular ski and snowboard resorts. For those of you who do not ski or snowboard we have plenty of other activities in the snow including inner tubing, toboggan runs, ziplining, and off-road tours. The fresh one and a half foot layer of snow also means time rent a pair of snowshoes for a trek in the forest. The main thing is snow has arrived, how you play in it is up to you. Make plans to come up and enjoy the white stuff. The Big Bear Lake Marketing Association through it's partnerships is responsible for development and daily management of 14 websites consisting of lodging, accommodations, resort cabins, vacations and reviews. We daily update over 30 news stories about Big Bear events and weather. We manage over 2750 landing pages of discount coupons and vacation planning. 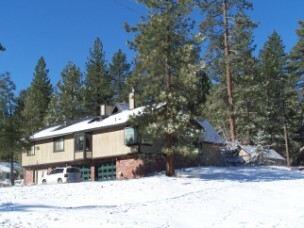 The sites have over 1375 current photos of the drive to the mountains, the four seasons, resort cabin interiors and exteriors & many events of local interest for families and groups; featuring all family friendly Big Bear lake AAA approved big group cabins for rent. Feel the mountain breeze, see and hear the rustling of the tall pines. Enjoy a personal encounter with God and nature at Golden Bear Cottages resort. Feel enlightened and serene. 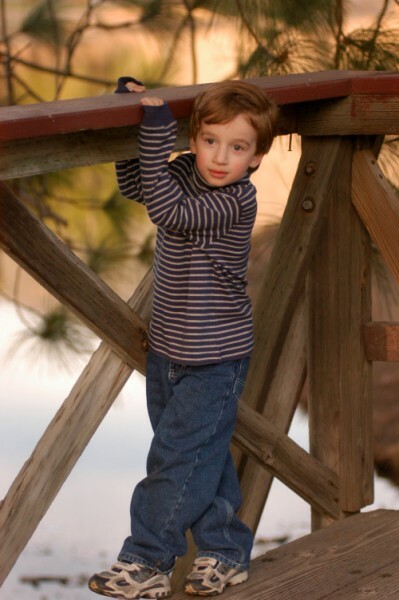 Enjoy a lasting sense of peace from a mountain retreat experience your family or group will remember forever. 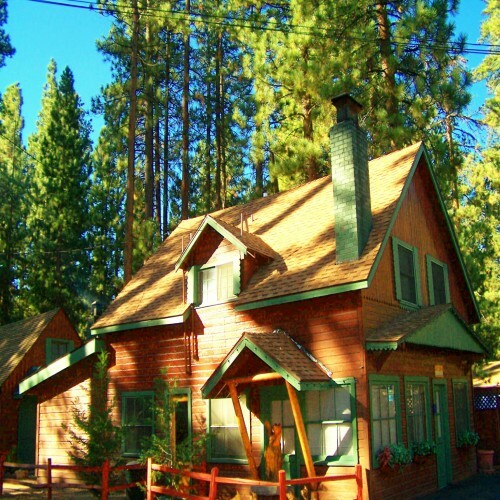 Golden Bear Cottages considers it a great honor to carry on the role of protecting and sharing the beauty of the California historic pine forests with our guests. Our goal is to nurture an environment in harmony with the nature and history of the mountain while allowing our guests to enjoy a relaxing Big Bear Lake alpine experience. We strive to make our resort an antidote to all that is excessive, formal, artificial or contrived. By focusing on the very essence of life, we hope to offer our family and group lodging guests a welcome retreat in tune with the spirit of the mountains. "Returning group; another great retreat at Golden Bear Cottages in Big Bear Lake. Once again, thank you so much for an amazing stay. We always appreciate all the extra service, hospitality and friendliness. All of our group leaders commented that each member of your staff were so accommodating to us. Thanks again for the late check-outs for group members who had later travel arrangements back to San Francisco. Your resort property and variety of cabin sizes is always perfect for our group planning retreats. We will see you again.' Jacquelyn Lindeman, California Youth Connection." April 26-28, 2012...days we will always remember up in Big Bear at Golden Bear Cottages... our church ladies where so thrilled and thankful to testify during our church service how uplifting and spiritually fruitful our retreat was...the beautiful, clean, rustic cabins contributed a great deal in our long-awaited activity. Our church group loved it. I personally am thanking you again for accommodating us, cared for my special requests...you, folks, are awesome! I know there will be a third time for me and family and friends to stay at beautiful Golden Bear Cottages. God bless you and everyone at Golden Bear Cottages. 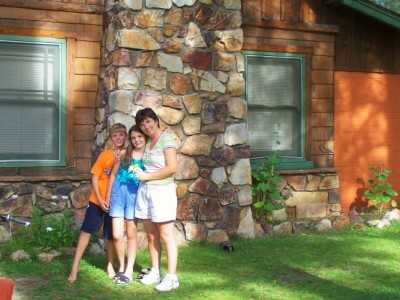 \"
"We rented out one of their larger cabins for a young adult retreat from our church. Booking was really easy, and Lisa was really helpful. The cabin was comfortable and had everything we needed for our weekend. None of the usual pitfalls of group cabins: low water pressure or unpredictable temperature fluctuations. Those things were a big deal for our group. We had a great time sitting around the tables in the kitchen playing games and talking. They had nice appliances for all the food prep we did, and plenty of kitchenware. It's close to Big Bear Village and the Alpine Slide, so we had the flexibility of making up our schedule as we felt like it. We even decided to visit the on-site jacuzzi, and the managers went out of their way to make sure we could access it even though the operating hours had ended. I'd recommend this place to other church groups for their retreats. It's not uber-modern so if you like flat screen TVs, this historic place probably isn't for you. It was perfect for our group's needs, and we enjoyed our weekend there!" 'Thankyou, Golden Bear Cottages for your special attention during our recent 80 th birthday group celebration. My wife Eileen was so appreciative for the gift basket, and the dinner reservations were superb. We can't wait to come back to see you soon. 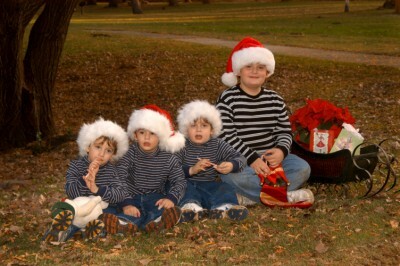 We should be back in a couple of months for the winter holidays. Next time we will plan to have the whole group for a family reunion.' Anthony and Eileen from East Highlands Ranch, CA"
"This was a great facility for our group of girls for a week-long Cheer Camp. Golden Bear's historic mountain resort setting was perfect. Lisa was just amazing !!! Stayed August 2011, traveled on school business for a retreat with a group of about 75. Great Value for a mountain group resort. Top Quality and Cleanliness. Superior Service! Group Booking Tip: talk to Lisa"
"We recently stayed at Golden Bear Cottages and had an absolutely fabulous time! Although we were there for an outdoor wedding, it's a great place for any stay! The staff bent over backwards to accommodate us. 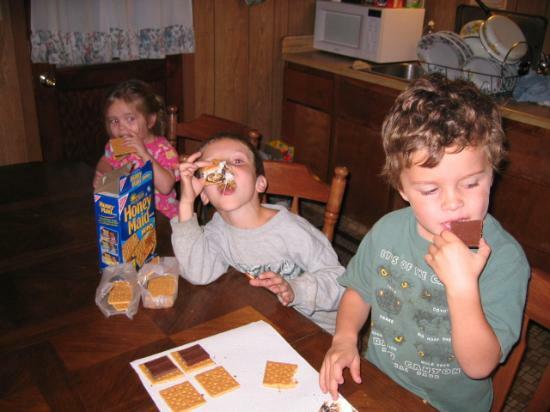 The large Cabin #28 is great for family reunions/weddings and family bonding! (7 bedrooms, sleeps over 20). We also reserved many smaller cabins for our group and enjoyed them just as much! I give this mountain retreat a 5 out of 5 top rating! 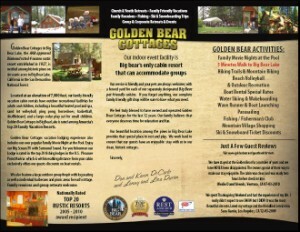 The Big Bear cabins for rent at Golden Bear Cottages are the very best. They focus on families. 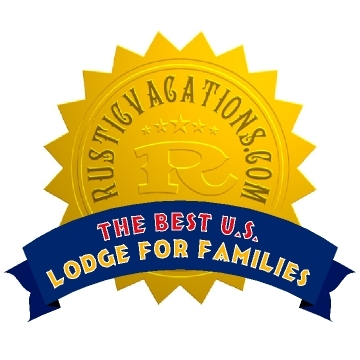 Fabulous and excellent family and group resort!" Group Review..."Wedding in Big Bear Lake. My 'Happily Ever After' began at Golden Bear Cottages Resort last week. What a wonderful wedding we experienced. The big retreat cottage was just perfect for our reception. Your suggestions for wedding planning and catering were great. Thank you also for your help with the Christian minister and salon services. It was so great to have everything right on the resort property. God bless all of you for all of your help." 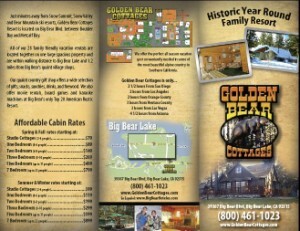 "Our family enjoyed a wonderful family reunion this summer at Golden Bear Cottages. Their staff was extremely helpful throughout the year-long planning process of the reunion. Each individual family was made to feel special by everyone from the owners, to the front office staff, to the maids and maintenance people. We were treated like royalty as a group with every request being taken care of promptly and professionally. The cabins were beautifully clean and so charming! 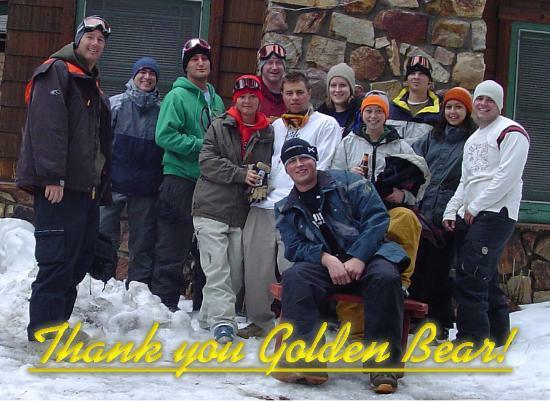 Everyone had such a great time that we are already planning another family reunion for next year at Golden Bear. Our family came from all over the US and this is the only place that we have ever liked so much that we plan to make it an annual Golden Bear Cottages reunion! This TripAdvisor Member: Liked: friendly people and Christian family values"
Golden Bear Cottages coupon and specials . . . .
Pet travel guide for dogs of ALL sizes. Pet friendly cabins. 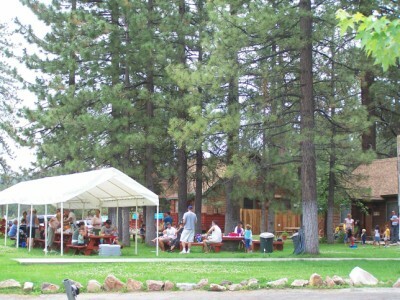 Many of our clean Big Bear Lake Cabin Rentals accommodate pets for group retreats, family reunions and conferences too! Check our AAA SPECIALS and see the best groupdiscounts. 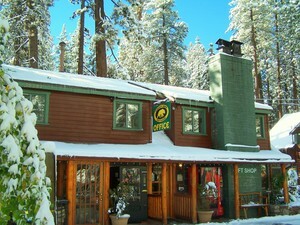 Call the Big Bear group lodging reservations and information office 909-866-4507 and speak with us today. 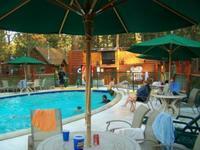 Golden Bear Cottages family friendly resort is one of the best places to stay in Big Bear.